Hearts sank when news broke early this year that many Vegas resorts—namely the dozen-plus MGM Resorts on the Strip—were ending their decades-long policy of free parking. After the announcement, few details were parsed out—until now. 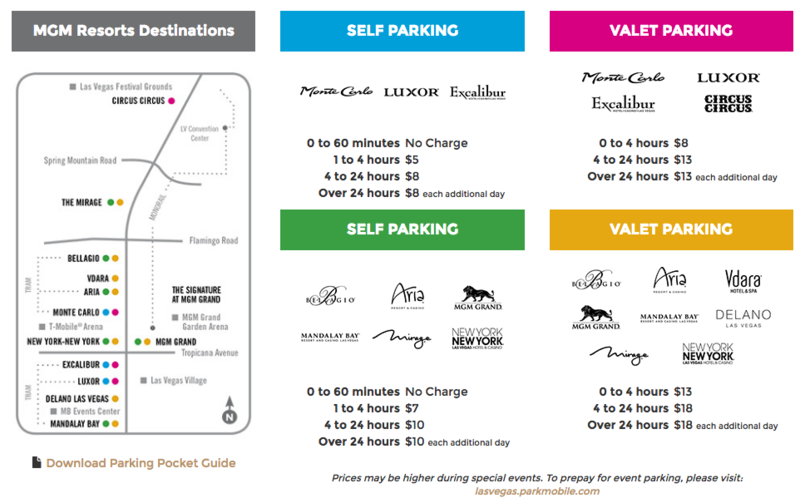 The first day of parking charges will be Monday, June 6, according to an email to M Life members, the loyalty card for MGM properties. The new fees are part of a “$90 million parking strategy to expand parking availability, implement technology upgrades and reduce the hassle and frustration resulting from outdated and inefficient facilities,” according to the missive. So, about the prices. It’s a bit complicated, so consult the legend below (click the image to zoom), via MGM Resorts. The price jump is pretty extreme, especially at the higher-end resorts, like Bellagio and CityCenter properties—and hotel guests are still required to pay; a video below has more info. There are deals for certain M Life members, as well as Nevada residents. Still no word on whether the Caesars properties—Caesars Palace, Bally’s, Linq, etc.—are instituting similar measures. Next articleWhat’s It Really Like to Be the Princess of Monaco?